My forecast is driven by ENSO Neutral conditions in the South Pacific between now and early December 2017, and my belief is that it will shift toward a minor La Niña (La Niña Lite) between mid December and March 2018. 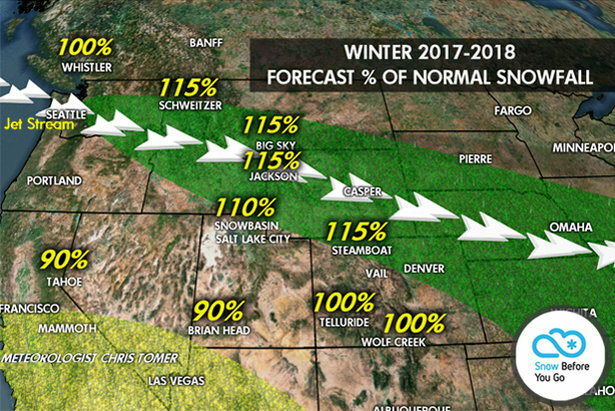 • Colorado, Utah, Wyoming, Montana, Idaho: Normal to above normal snowfall this winter at the ski areas. • Pacific Northwest: Normal snowfall at the ski areas. • Whistler/Blackcomb & Banff: Normal to above normal snowfall. • California: Normal to slightly below normal snowfall at the ski areas. • Northeast: Normal snowfall at the ski areas. Keep in mind this is an early-season, broad-brush forecast. It's important to watch ocean temperatures in September and make adjustments. 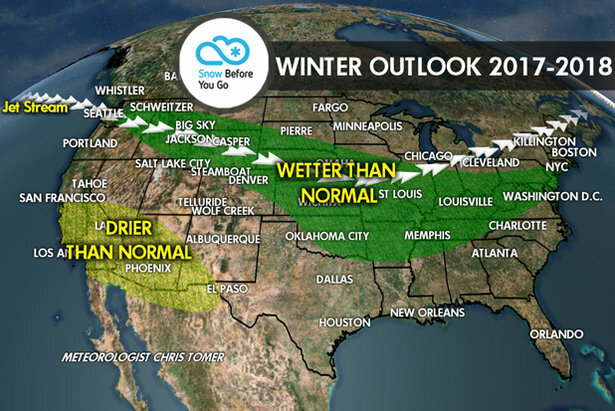 This forecast might be helpful if you're booking a Christmas or winter ski trip. The Intermountain West is trending in a wet direction, but the wildcard for early season ski trips will hinge on temperature trends. Early season temps can be too warm for some resorts. Subscribe to our free newsletter and get the Snow Before You Go Forecast delivered straight to your email inbox each week! Obtenir les bulletins de neige, les prévisions météo, et les conditions pour vos régions préférées. Commencer.